In today’s mediated society, you cannot watch the evening news, surf the net, or engage in a news-related conversation without the term ‘citizen journalism’ popping up along the way. Blogs, forums, and uploading of photographs or videos to the Internet are now being labeled ‘citizen journalism’ as separate from mainstream or professional journalism (Barnes, 2012). “Citizen journalism is news content produced by ordinary citizens with no formal journalism training,” (Johnson & Wiedenbeck, 2009). The number of citizen journalists has increased in the past several years due to the advancement of new media, the technology widely available, and the credibility associated with everyday citizens. The role of the general public has changed from only receivers, to receivers and senders. Citizens are no longer simply sources of information or audiences for news; they are now recorders and creators of news (Mythen, 2010). The advancement of new media, particularly the evolution of social networking websites including Facebook, Twitter, and Flickr have changed the approach that news outlets take to publish news and the way in which publics absorb it. Sending informational tweets or posting camera footage is now a relatively easy task with a simple process, which assists in the dissemination of news (Barnes, 2012). New media has given everyone online the opportunity to send newsworthy information along to media outlets and they become a citizen journalist. “Ambitious activists have excitedly proclaimed that a ‘DIY revolution’ is taking place in and through new media, typified by the embedding of blogging sites, video sharing websites and social news outlets,” (Mythen, 2010, p. 48). There is an influx of technology that is now widely available to everyone, which increases the probability that newsworthy information is captured and shared by citizen journalists. Smartphones, tablets, laptops, and cameras are just some of the gadgets that are used to record and send such information. Technology has altered public engagement and the quality of information transfer (Mythen, 2010). It has also impacted the methods that journalists use to create and send out content. “Technological advancement has caused traditional journalists to take a second look at the way their craft is practiced and make adjustments, if they are to take full advantage of the new technology,” (Barnes, 2012, p. 24). “Trust in mainstream media is eroding,” (Johnson & Wiedenbeck, 2009, p. 333). People who are not directly affiliated with journalism, news or media outlets are often trustworthy and regarded as more credible sources compared to legitimate journalists. Citizen journalists have no ulterior motive for sharing newsworthy information; they simply want others to be informed or have the opportunity to witness what they have. “The citizen is by definition more neutral or independent than the employed journalist,” (Tilley & Cokley, 2008, p. 109). Citizen journalists will include sources to ensure their integrity, as well. By allowing the public to verify information easily through the use of hyperlinks embedded in the story, citizen journalists can improve their perceived credibility (Johnson & Wiedenbeck, 2009). The concept of citizen journalism can compare to the term, public sphere. “The public sphere is defined as working toward an ideal speech community wherein each potential speaker might have equal opportunity to be heard,” (Jackson et al., 2011, p. 22). Much like citizen journalism, assess to the public sphere is open to all citizens. Anyone, regardless of his or her age, gender, race, culture, education, and upbringing has the capability to contribute to the public sphere. One’s ideas are not more valid than the other; by having an equal representation of everyone’s thoughts and feelings, the general public can make informed decisions to the best of their ability. Both citizen journalism and the public sphere utilize communicative actions to create a binding effect through the creation of unconstrained, unforced, mutual understandings (Jackson et al., 2011). Citizen journalism has expanded the range of information and opinion available to citizens (Compton & Benedetti, 2010). This coincides with the idea that everyone comes together in the public sphere to gather, share, and discuss information. Although Habermas created the concept of public sphere in reference to engaging authority (Jackson et al., 2011), it can be applied to engaging various publics and citizens, as well. As we all have the opportunity to capture information with our smartphones and disperse it into society via new media, we also have the chance to discuss our society, government, and way of living with others members of the public around us. Anyone can enter the public sphere and challenge the normal way of doing things in society (Jackson et al., 2011). Journalism’s role in the public sphere is to verify facts, in additional to, creating well-balanced stories and arguments on daily issues (Jackson et al., 2011). This corresponds with the citizen journalist’s position as a person sending and receiving news with the continuous advancement of new media. Citizen journalism does not discriminate against any information, nor does it imply that citizen journalists are the only source of information. It simply acknowledges newsworthy stories and gives the general public the opportunity to absorb everything and draw their own conclusions. Citizen journalism is providing yet another medium to the message. Barnes, C. (2012). Citizen journalism vs. traditional journalism. Caribbean Quarterly, 58(2/3), p. 16–27. Compton, J., & Benedetti, P. (2010). Labor, new media and the institutional restructuring of journalism. Journalism Studies, 11(4), 487–499. Jackson, J. D., Nielsen, G. M., & Hsu, Y. (2011). Mediated society: A critical sociology of media. Canada: Oxford University Press. Johnson, K. & Wiedenbeck, S. (2009). Enhancing perceived credibility of citizen journalism web sites. Journalism & Mass Communication Quarterly, 86(2), 332–348. Mythen, G. (2010). Reframing risk? Citizen journalism and the transformation of news. Journal of Risk Research, 13(1), 45–58. Tilley, E., & Cokley, J. (2008). 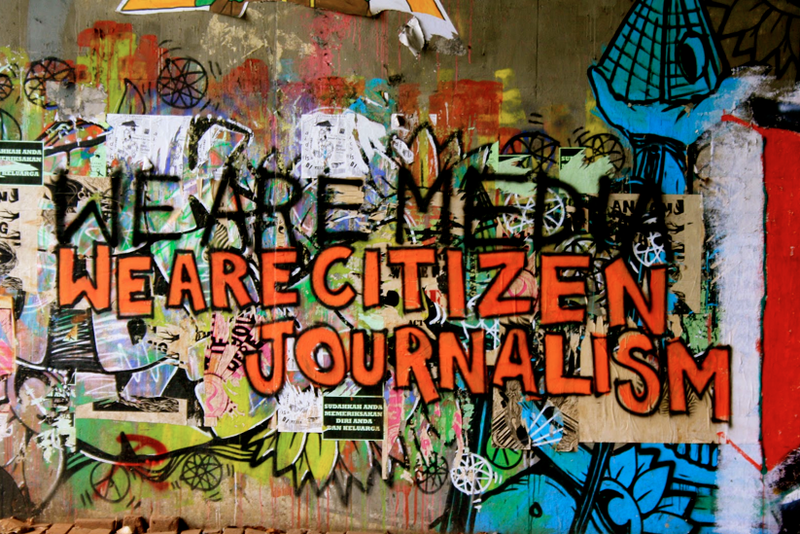 Deconstructing the discourse of citizen journalism: Who says what and why it matters. Pacific Journalism Review, 14(1), 94–114. Gallery | This entry was posted in media culture society and tagged citizenship journalists, credibility, culture, journalism, media, new media, public spheres, social media, technology. Bookmark the permalink.